Eden’s Edge is at the centre of an amazing range of beautiful views, activities and places. Walk along stunning golden sand beaches, take amazing photos from cliff and forest walks, watch seals play almost at your feet, catch your own salmon for dinner, or relax at one of our popular micro-breweries and cafes / wineries. All these and many more are within just two hour’s drive of Eden’s Edge. Abel Tasman is New Zealand’s smallest, but one of its most beautiful and popular national parks. It’s famous for its gentle golden sand beaches and clear, sheltered waters. We are very familiar with the Park and expert at helping you choose the best Park activities for you. Walking, kayak and water taxi tours are always of good quality and easy to arrange at check in. Canyoning in Abel Tasman National Park, with slides down waterfalls, jumps into crystal clear pools and abseils or zip-lines is also very popular. Many operators provide a complimentary pick up & drop off service; we are 20 minute's drive away. Kahurangi National Park is a vast playground for the more adventurous with inspiring views over fantastic native forest. It’s also home to the world’s only carnivorous snail. Our region’s closest entrance to this vast and beautiful wilderness area is only 40 minutes’ drive away, through quiet farmland. 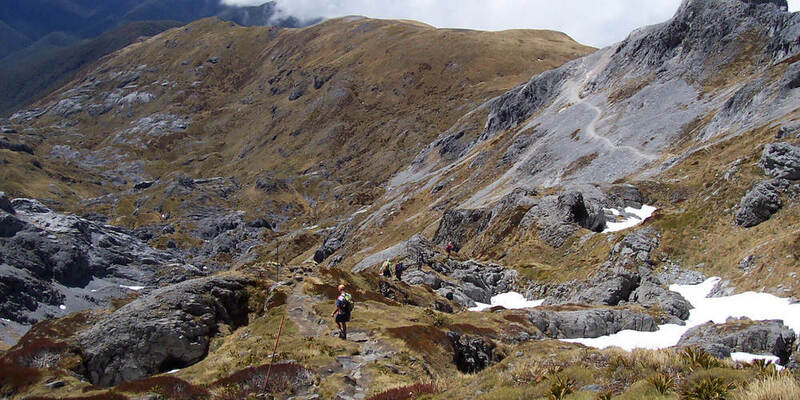 Take a day hike up Mount Arthur (1800m - 6 hours return) and/or a loop walk (about 3 hours). Longer 3-6 day hikes are also possible. Golden Bay is an excellent day trip with brilliant sightseeing opportunities, walks, attractions and artists / galleries. Our guests’ favourites are; (from left to right, above) Wharariki Beach, Pupu Springs and to catch your lunch or dinner at Anatoki Salmon Farm, near Takaka; they can hot-smoke your fish while you wait. Pupu Springs (Te Waikoropupu Springs) is near the Farm and is the largest cold water spring in the Southern Hemisphere and the second clearest waters in the world. Blue Lake, in Nelson Lakes National Park, is now the clearest and just 90 minutes’ drive from Eden’s Edge. Other popular walking activities include the Groves and Wainui Falls. Harwoods Hole and The Resurgence are both beautiful short walks through New Zealand native forest. At 357m Harwoods Hole is the deepest naturally occurring vertical shaft in the Southern Hemispheres. The Resurgence is a crystal-clear pool where the Riwaka River reappears after three days underground. Both are within 20 minute's drive of Eden's Edge Lodge. We are a mecca for mountain biking. The region’s Great Taste Trail runs past our gate, with Kaiteriteri Bike Park 30 minutes' biking further along the trail. Our region is ranked ‘Gold’ by the International Mountain Bicycling Association (IMBA). This is because we offer so many and such a wide variety of trails, from gentle and family-oriented to full-on downhill runs, backcountry adventures and everything in between. We, and Rotorua in the North Island of New Zealand, are the only two places outside America with Gold status. The Motueka River is well known as an excellent trout fishing river. We can put you in touch with a trout fishing guide. Sea fishing charters can be arranged also. If you have your own equipment you can go sea fishing on your own (a licence is required for fresh water fishing). We have fly tying equipment for experienced fly fisherman who like to tie their own flies. You can also go over to Golden Bay and visit the Anatoki Salmon Farm where you can fish for and catch your own salmon. Farm staff will then cook it for you while you wait. Motueka's small but busy airport is the Tasman base for a pilot training school, skydiving (www.skydive.co.nz), microlights and hang-gliding (www.skyadventures.co.nz). Our settled weather and benign climate make us a popular base for these activities. Apart from the hang-gliding, all these activities are less than ten minutes’ drive away. Courtesy cars operate.